Welcome to the Berliner Restoration Project! 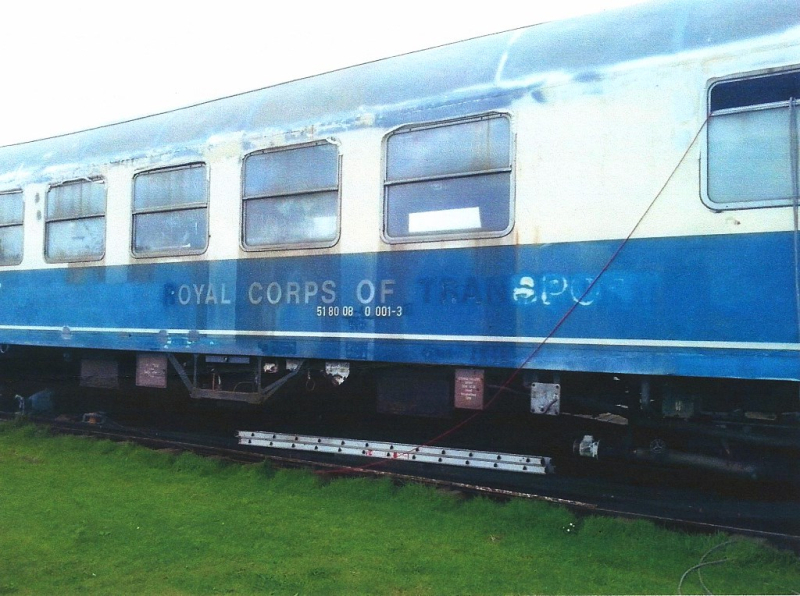 Our aim - "to restore and preserve the last remaining coach of the British Military Train"
Twenty five years since the last British Military Train operated, all of the rolling stock used has been either sold, scrapped or rebuilt - with one exception. This single original coach survives, a restaurant card built specifically for use on this service in 1967 by Wegmann in Kassel, Germany. It has a fully original interior and has never been used for any other railway purpose than the operation of the BMT between Braunschweig and Berlin Charlottenburg; thus it represents the last tangible link to the tradition and history of the British Military Train, the staff who operated the service across the Iron Curtain and the many tens of thousands of passengers that travelled on board. It is now located at the Fort Paull Military Museum near Hull, but over the years succumbed to the North Sea climate and urgently needs thorough external restoration. The original paint finish has cracked and weathered, leaving the steel coach body and framework open to attack from the elements. 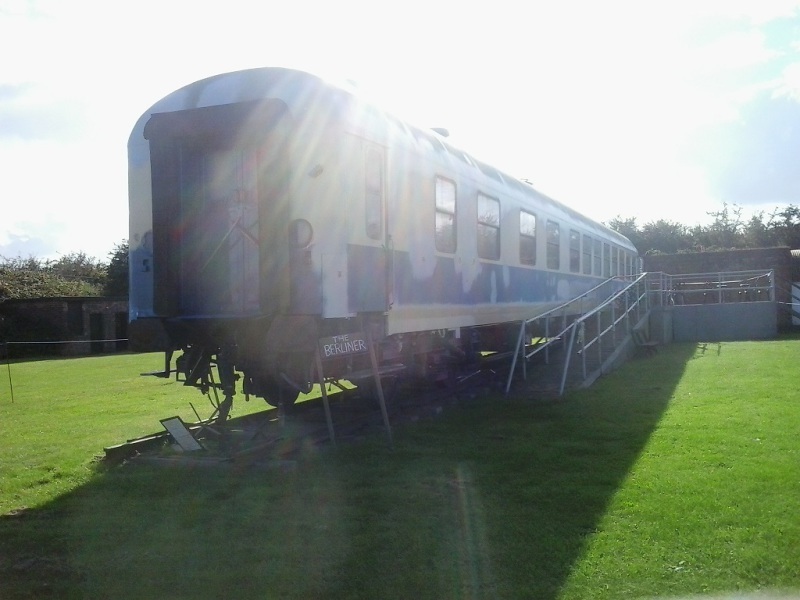 The museum itself has almost no funds to pay for the restoration of this unique railway vehicle. 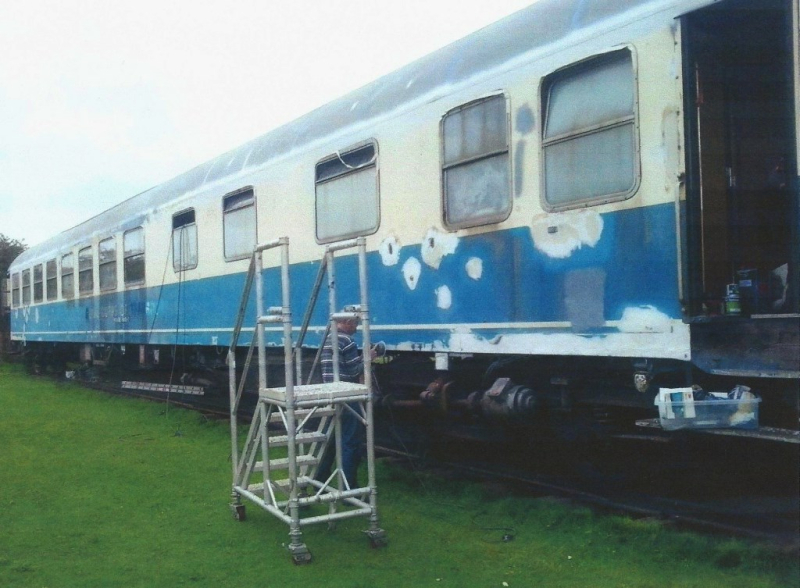 The Berliner Restoration Project has therefore been establised to raise money to fund the restoration work required to save this unique piece of military and railway history for future generations, and help tell the story about this period in Europe's history. Some unseasonally pleasant weather during the last two months has allowed restoration works to continue, with the first coats of sprayed topcoat paint being applied. This includes the lower ivory pin-stripe along the base of the coach, and the corridor connector doors at the end of the coach. The following progress pictures were taken on 2nd October. 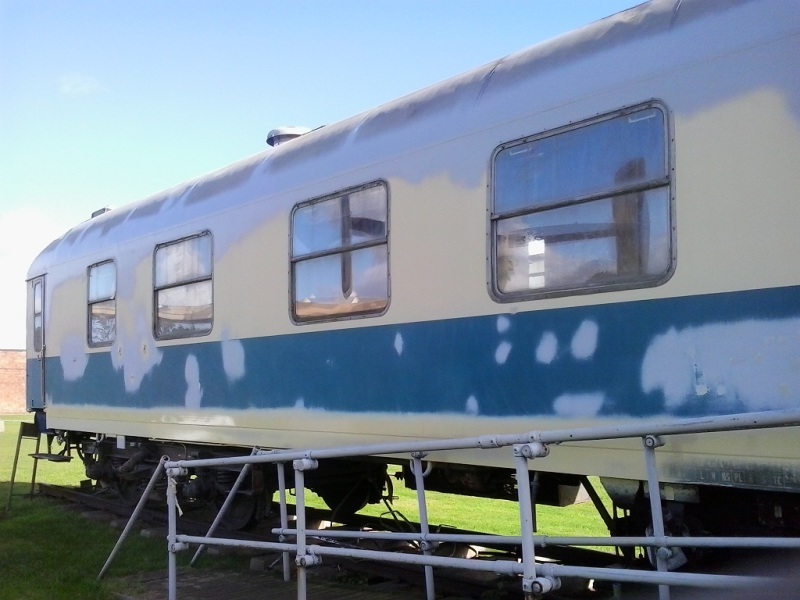 A busy few months has seen restoration works finally commence on the Berliner Restaurant Car, 25 years after the coach was last in service and almost thirty years since the coach was last overhauled. Some of the worst corrosion had occured around the rivets that secured the gutter strip to the edge of the roof, and around the brackets on which the Union Jack flagboards were hung. Years of accumulated grime have been removed too, and the photo below shows the extent of the cleaning work completed so far. Old, faded lettering has been removed where required to treat corrosion. All lettering and logos were photographed in detail before preparation work began, and these images will be used to recreate the lettering once repainting has been completed. 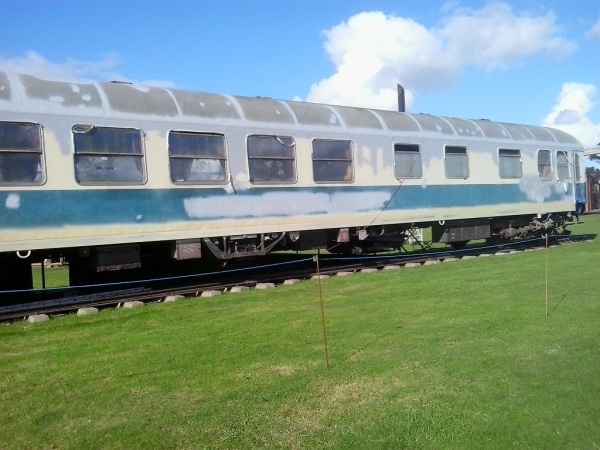 Major progress has been made with the agreement to proceed with the restoration of the coach. TeaMAC Paints will supply all materials used, with the restoration itself being carried out by the Fort Paull museum working with an experienced heritage restorer. Weather conditions are not yet ideal for painting, but the process of treating the rusted steelwork, photographing and removing faded vinyl lettering and corroded guttering has begun. Continuation of efforts to raise funds and awareness amongst the local community, as well as across the Army, Rail and Heritage sectors . Assessment of painting costs is ongoing, with the final restoration cost figure expected to be finalised in April 2016. 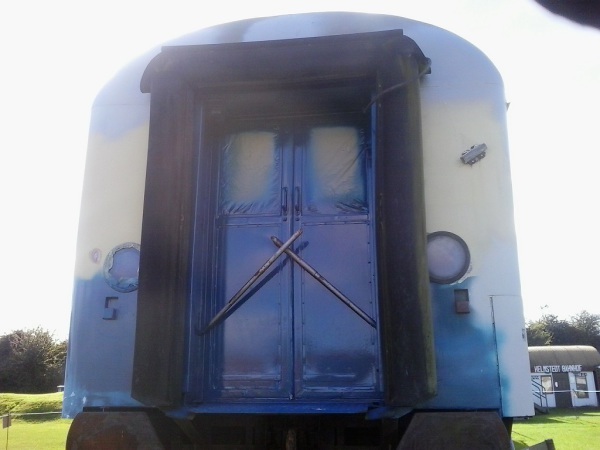 TeaMAC Marine Paints of Hull committed to support the project, with the supply of specialist rust treatment, undercoat and topcoat paint products required for the project, including technical advice and assistance. Follow the link at the top of this page for more information! Site visits and condition assessments of the coach carried out in order to establish the feasibility of the project and the work involved. 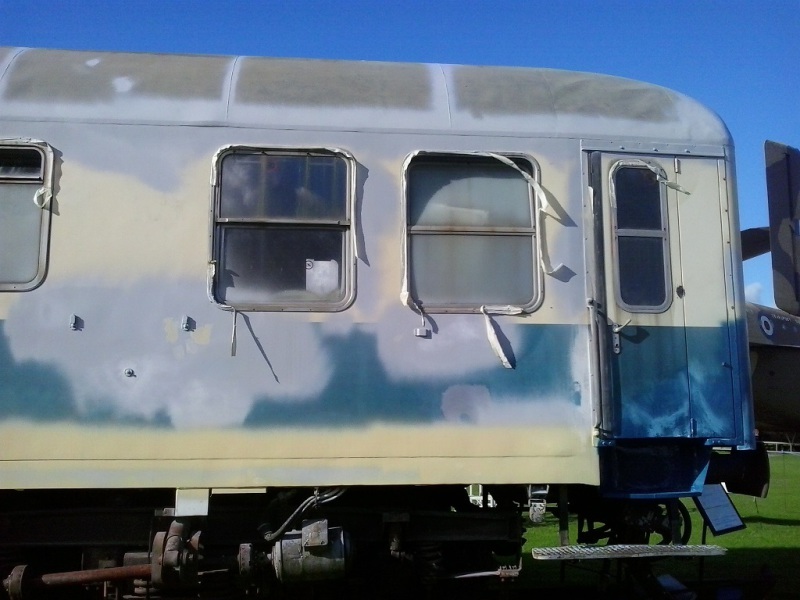 The photo below shows the condition of the coach at the time the restoration project began. Pay a visit - the Fort Paull Museum has now re-opened for the 2016 season, so go along and support the museum and this project! There will shortly be donation collection boxes positioned both within the coach and in the museum shop, so please look out for these and give generously. We are also looking for local businesses who wish to support this unique project with donations of materials, time, labour or in any other way. We will be featuring all of the businesses who are able to support us on all of our publicity, fundraising brochures, here on the website and also as part of the final permanent exhibition at Fort Paull. Direct donations - make a payment directly to our Berliner Restoration Fund, either by cheque or bank transfer. Please contact us for payment details. If you wish to record your donation in our donor's register, please email us (information@british-berliner.org) with brief details of your donation together with your name and address.